We always question what we may not understand. It’s human nature. As people, we rely on each other for information about things we might not have the best knowledge about. The resulting collection of ideas might be called data, rumor, or myth. The trouble with myths is that they are oftentimes a bit off the mark. This can cause results ranging from slight misinterpretations to full-on reversals of the truth. With this in mind, here are a few deep drawn myths that can be cleared up quite easily. The deep drawn process cracks the material. 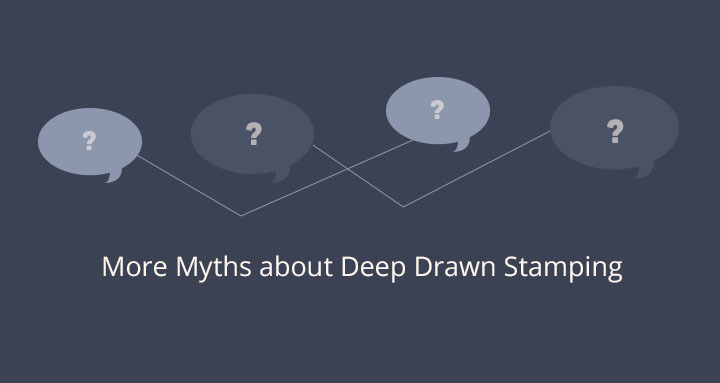 This myth no doubt came about during the early years of deep drawn stamping. In its infancy, one of the risks of the deep draw process was the creation of cracks due to elongation of the metal. The knowledge and technology of today has made this problem not only manageable, but almost non-existent. Additionally, quality control measures are in place that ensure that this myth remains where it belongs; in the distant past. Only soft metals can be deep drawn. Simply not true. The deep draw process is capable of creating parts from all manner of material. With the technology and tooling of today, even materials as strong as stainless steel can be easily managed. Complex alloys, tin, stainless sheet metal, and a host of other metals can be processed with speed and quality. This myth can be stamped out. Deep drawn stamping creates too much scrap. Here is another myth from the pages of history. New, cutting edge engineering methods ensure that every part is created using a blank that has been optimized for size. Complex equations regarding material flow during the process allow engineers to dramatically reduce the amount of scrap material produced per part. Send this myth to the scrap bin. Myths often come about due to limited or dated information. The technology available today has created a dramatically different manufacturing world than that of the past. Luckily, the same technology makes accurate information quick and easy to find. It is always best then to double check your information. Do a bit of homework, so to speak. The truth is out there.